In my solution, I am referencing a couple of 3-party assemblies. dotCover calculates coverage statistics for those assemblies which reduces overall coverage. In the image below, Xunit.Specifications is a 3-party assembly and should not be covered. Please consider implementing an option to exclude such assemblies from coverage. I hadn't updated in a few builds, but b1.0.57.5 (7/7/2010) has a new 'Coverage Filters' feature. Seems to work well for the one-off's, but I agree, it'd be nice to be able to simply ignore any non-Solution references. 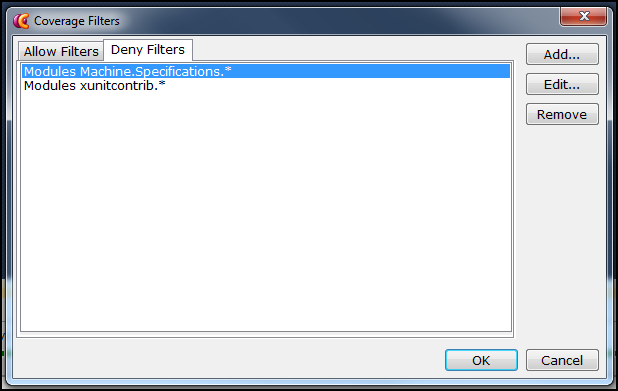 Yes, coverage filters can help to exclude 3-party assemblies. Soon there will be an option to match coverage results with the current solution and exclude irrelevant assemblies.